Tigers & Strawberries » Do You Know Umami? When we were growing up, there learned that there were four basic tastes: salt, sweet, sour and bitter. We were told that our taste buds had special taste receptors in particular zones on our tongues that detected these four tastes and that all other components of flavor came from our olfactory sense–the sense of smell. Well, it turns out that what we learned in middle school about tastes, our tongues and noses, was not quite complete or correct. There is a fifth basic taste. It is called “umami,” and a Japanese scientist named Kitunae Ikeda isolated one compound which contibutes this taste back in 1908. Working with a seaweed broth, he isolated the amino acid, glutamate, as one of the sources for the taste which is described as “meaty, rich, savory and satisfying.” Glutamate itself was already a known substance, having been discovered in 1866 by a German chemist named Dr. Karl Ritthausen who discovered it while studying gluten in wheat. “Umami” itself is a compound Japanese word, from the root words, “umai” meaning “delicious,” and “mi,” meaning “essence,” and while it is often used to describe the flavor enhancing ability of the salt form of glutamate, ,monosodium glutamate, that is not the only proper context for its useage. In fact, researchers have found that umami accurately describes the flavor of many amino acids and proteins. In 2000, researchers at the University of Miami discovered the taste receptor for umami, which essentially proves that umami is a basic taste, for which humans had evolved a hunger. This receptor, named “taste-mGluR4” responds not only to glutamate, but in greater and lesser degrees, to every other amino acid and nucelotide. Considering the myriad of uses to which amino acids are put in the human body, it is no wonder we are programmed to enjoy their flavors. Amino acids are necessary in building muscles, enzymes and other chemicals necessary to bodily function. So, what does all of this mean to cooks? Does this mean we need to study chemistry and put MSG in everything? It means we just need to look at what foods have large supplies of naturally occurring glutamates and amino acids and combine them with the principles we already know of good cooking, to help us make our dishes even more delicious. It isn’t like any of these ingredients are new or anything. People all over the world have been cooking with glutamate and amino acid rich foods for thousands of years. Take a look at the foods surrounding the new cookbook, The Fifth Taste, above, and think about how many of them you have in your kitchen right now. If you are like me, you probably have plenty of umami sitting in your cupboards, refrigerators, shelves and countertops, just waiting to add goodness to your next meal. A quick glance at my illustration should identify soy sauce, nori, dried and fresh shiitake mushrooms, red wine, truffle oil, parmesan cheese, sun dried tomatoes and tomato paste. Every serious cook in the world is bound to have one or two of those ingredients in their kitchen at any given time. The concatenation of jars, bottles, tubes, packages and loose items above are just what I pulled off my shelves this morning when I went on a mission to find good examples of umami-rich foods. 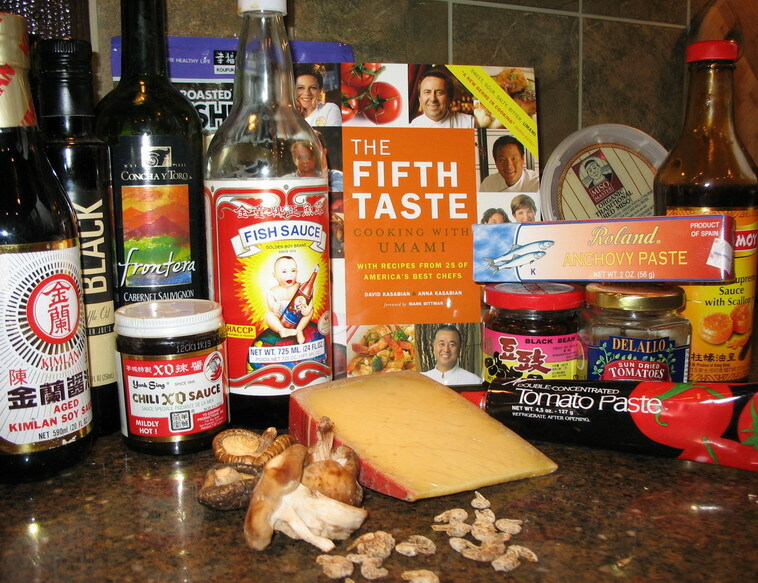 Over the next few days, look for posts specifically listing and identifying umami rich foods from both the East and the West, recipes featuring my favorite flavor and a review of the new cookbook, The Fifth Taste: Cooking With Umami by David and Anna Kasabian. The upshot of all of this is, if you don’t know umami now, you will by the time I am finished with you. Interestingly (to me, at least), folic acid in foodstuffs is bound to multiple glutamate molecules and has to be removed from them in the small intestine before it can be absorbed. Bless you for not declaring that “we all have to quit our bitchin’ about how we suffer when we eat foods with msg in them because msg is in foods naturally and therefore we can’t possibly be suffering because it’s so NATURAL!” I certainly enjoy many of the foods you listed above (um, haven’t gotten to the rarified heights of truffle oil yet, but you have a way of inspiring us to try new things! ), but just because a substance is good, doesn’t mean that a purified powdered sub-component of it is also good, or good for us. I look forward to reading what you have to share with us about NATURAL umami. Aarrgh! Thank you, Persimmon, for correcting that. I am just lucky that I didn’t use an “e” in it, because the root word it came from is “gluten.” Pharm student, eh? Cool! Hence your interest in herbs. I once, long ago, was a pre-veterinary/pre-med student, so I have enough chemistry and biology to get myself into trouble. Well, actually, it tends to help me understand cooking, baking and nutrition pretty well so I can teach it more easily. Food chemistry and the pharmacology of herbs are two subjects I have always loved. So, please, jump in at any time with me and correct me when I get things wrong. A layman’s understanding is always different than an expert’s. So, is the folic acid in food (like kale–yum) removed from the glutamate by action of an enzyme in the gut? Judy–while the scientific research into the effects of MSG as a food additive are inconclusive, I do tend to believe that people are affected by it, as I have seen it happen, consistently with some people after they eat something with MSG, even if they didn’t know it was in there. When people show symptoms without knowledge of the additive’s presence, that tends to let out the possibility of it being a placebo effect or psychosomatic illness. The bottom line is this–while I think that the use of minute amounts of MSG does little to no harm, it isn’t necessary to use it in order to utilize the taste of umami in good cooking. There are plenty of other sources of glutamate (I spelled it right that time!) and other amino acids in the kitchen, which do no harm, and are in fact, quite nutritive. Look for a long post sometime today or this evening about the ingredients in Asian kitchens filled with glutamate and other amino acids that contribute to the umami taste in cooking. Yup, if the folate is bound to glutamates, the whole lot gets whacked off by proteolytic enzymes in the stomach, and then in the small intestine futher enzymes take the glutamate chain down to folate monoglutamate, which gets absorbed. Older persons often have less stomach acid (achlorhydria) and their protein-whacking enzymes don’t perform as well, which is why oldsters are often recommended to take a folic acid supplement. It’s also one reason synthetic folate is more bioavailable; it doesn’t have to be removed from anything else to be absorbed. ‘Course, most of us should just eat more greens anyway. And yeah, I am trying to integrate herbal knowledge into my pharmacy practice where appropriate. And reclaim my food culture. And be married. And, you know, finish school. Whee! I know that when I was trying to get pregnant, my doctor had me taking extra folate (in addition to eating tons of greens–which is fine, I love the things) because it supposedly is found to help prevent spinal abnormalities in fetal development. I know she had me taking pretty massive doses of it in addition to all the other prenatal vitamin potions and whatnot. Herbalism is one of my interests as well, but I am not nearly so well read on it as I was about five to ten years ago. Then, I kept up with the research pretty well, but now–I have fallen behind. Good on you for combining the best of allopathic medicine and herbalism. I think that is just great. More doctors and the like should be that way. A very interesting and informative read, Barbara. You forgot nam pla fish sauce, the ultimate umami! There are several posts in this series, Trig–in the one entitled “Umami from the Oceans of Asia” I cover nam pla.